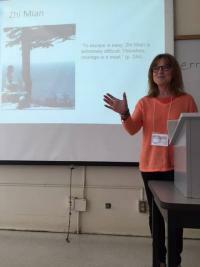 Mindfulness and Compassion: The Art and Science of Contemplative Practice, a conference held at San Francisco State University from June 3-7, 2015, brought together leading scholars, contemplative teachers, and neuroscientists to discuss the intersection of science and Buddhism, and the role of compassion in wellness. Donna Rockwell, PsyD, Saybrook adjunct faculty member, and co-teacher (with John A. Patterson, MD) of Mindfulness, Meditation and Health in the School of Mind-Body Medicine, and Mindfulness and Spirituality in Clinical Practice in the School of Clinical Psychology attended the conference, presenting her research findings on the role mindfulness training can play in the education of clinical psychologists. Her presentation: If I Only Had the Nerve: Mindfulness and Courage in Psychotherapy: Implications and Applications, was featured in the session: Engagement with Mindfulness Interventions. Along with Dr. Rockwell, Saybrook was represented by student, Tamami Shirai who presented: A Clinical Study of a Meditation Class in Cardiac Pulmonary Rehabilitation, in the session: Mindfulness Interventions for Treating Physical Conditions.